The most recent concern over man-made fabrics vs. animal or plant based fabrics, cheap fashion and slow fashion are not “new” concepts. Have you ever heard of the Rational Dress Exhibition at Kensington Town Hall in 1883, or the Health Exhibition in London during the Spring of 1884? Was this the beginning of the end of the corset? English architect Edward William Godwin (May 26, 1833 Bristol – October 6, 1886 London), was best known for his Ruskinian Gothic style of architecture, evidenced in the Guild Hall Northampton. Starting in the 1870’s through the 1880’s, Godwin was associated with Liberty’s. He designed wallpaper, printed textiles, tiles, “art furniture” or metal work set the tone in houses of those of an artistic and progressive attitude. Oscar Wilde said, “Godwin was one of the most artistic spirits of the century.” In 1884, Liberty appointed Godwin to supervise the Costume Department. believed wearing wool “close to the skin,” was healthy. Jaeger began creating wool suits, around the same time he cut ties with Germany around the start of World War I, and became a British brand. Long johns were the beginning leading to an established clientele looking for British made garments at a reasonable price. Jaeger’s branded his fashions with wool and exotic fibers such as cashmere, angora and alpaca. Jaeger’s yarns are also used by the hand knitter. Here’s a photo of camel hair fabric, natural cashmere yarn undyed and brush tail possum from New Zealand. I wanted to title this post “Hand Knitting Meets The Industrial Revolution,” but I realized yarn is spun using a machine too. I recently completed two classes in Fashion Design at Canada College located in Redwood City, California, one of which was Flat Pattern Design. The other class, “Designer Techniques” discussed different ways to refashion an existing pattern and make it your own. Demonstrating a technique not covered in class was one of the course requirements. I elected to combine hand knitting with fabric. For the sample, I incorporated techniques from Flat Pattern Design and drafted a half scale dress with princess seams. The pattern pieces are pinned to the hand knit and traced with two rows of stitching using a teflon foot. An alternative technique would be to baste a line of stitches on your fabric using sturdy thread. With your knitting needles, pick up into the stitches and knit down to create an attached piece of knitting. In order to eliminate bulk from seams, position the knit fabric with an 1/8″ to 1/4″ seam allowance on the hand knit and 1/2″ seam allowance on the fabric. Combining hand knit with fabric is an idea I’ve been thinking about for quite some time. “Designer Techniques” was the perfect venue which presented an opportunity for me to take my idea of combining hand knit and fabric a reality. At the end of August 2017, I decided to enroll in a Fashion Design Program at a not so local community college. Immediately, I was thrust into the lanes of commute traffic arriving at my location at least an hour before class two mornings a week. Surrounded by an interesting group of like-minded individuals, I learned so much about the material and myself. Flat Pattern Design was an intense, rigorous class with a language all its own. The process of translating a two-dimensional design into a garment was challenging and at the same time, a rewarding experience. Above is a sample of various half scale and quarter scale dart manipulations I produced. The final project for class consisted of using a basic bodice, sleeve and skirt sloper, along with various dart manipulations, in order to design a garment. My design adopts and adapts the loose fit of the kimono by incorporating the dropped armhole along with the chemise silhouette. Godets are added on the side seams to add fullness imitating fabric layers of the kimono. Fabric folded origami sculptural motifs are added to the surface of the design. The dropped armhole reflects fashion of the 1940’s along with fabric choices reminiscent of the Mod print fabrics of the 1960’s. Through the use of dart manipulation, my design expresses the influence the Japanese culture and the 1960’s played in my life. Just by chance, my final garment fits me too! On one of my recent visits to Britex in San Francisco, I learned the store was phasing out sewing patterns from the “traditional” companies like Vogue for Indie and independent designers. I respect Britex’s attention to uniqueness and its historic reputation to stand apart from the rest, especially craft/fabric stores, but it’s sad to say good-bye. I traced the patterns onto medical pattern paper, and cut out a muslin of each pattern, and attended a garment construction class with Sally-Ann Flak. Sally-Ann fitted the patterns to my body, and I incorporated the changes to the pieces. Here is what I learned about my body in relation to these two patterns. The pants pulled down in the back because my derriere sits low and I needed to add extra fullness. I added 1/2 inch 6 inches down from my waist by cutting and spreading the pattern piece. The front pants piece required no alterations. The top ended up being two sizes smaller than the pants. As with the Vogue pattern, I traced and cut a muslin of the pattern. To begin with, the pants needed to be shortened 3 inches and the pant legs needed to be redrawn. The crotch length on the front needed to be shortened 2 inches. The waist on the front and back needed to be decreased by 3/8 inch. I needed to slash and decrease the hips by 1/2 inch. The back darts were a bit too long, so the adjustment didn’t require me to redraft the darts. The jacket is one size smaller than the pants, and needs to be fitted. I have a feeling the jacket needs to be one size smaller and 2 inches shorter. Of course, the patterns are two different styles and probably is not a fair comparison, but I’m definitely developing a deeper understanding of pattern fit and alterations. My bod is not in proportion. The top of my body is two sizes smaller than the lower portion of my body with one hip higher than the other, and my hips tilt forward. For a long time, I’ve wanted to delve into the world of fashion design, and I believe now is the right time. Staring in August, I plan on exploring the Fashion Design and Merchandising Department at Canada College in Redwood City, CA. An interesting blog on the history of fashion. 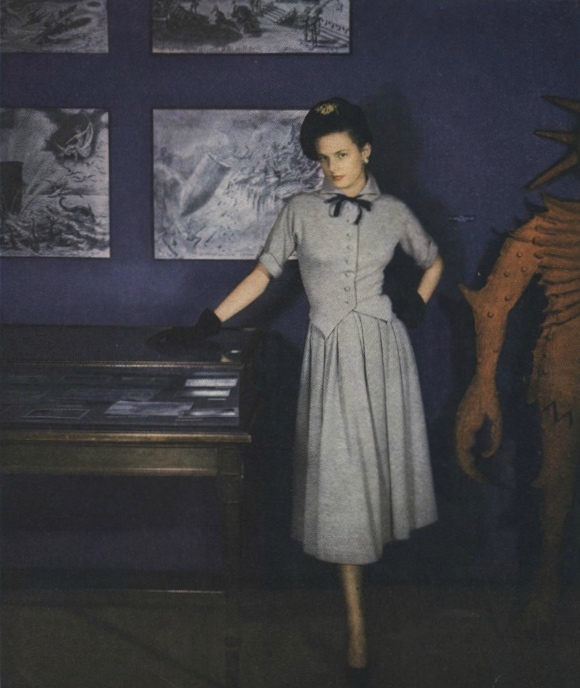 Vogue 1120 by Lanvin, Vogue, October 1950. Photo: Richard Rutledge. Born Marguerite di Pietro, Marie-Blanche de Polignac (1897-1958) was the only child of Jeanne Lanvin and her first husband, Italian aristocrat Emilio di Pietro. Marie-Blanche (who is sometimes called the Comtesse Jean de Polignac) was director of Lanvin from her mother’s death in 1946 until the appointment of Antonio del Castillo in 1950. 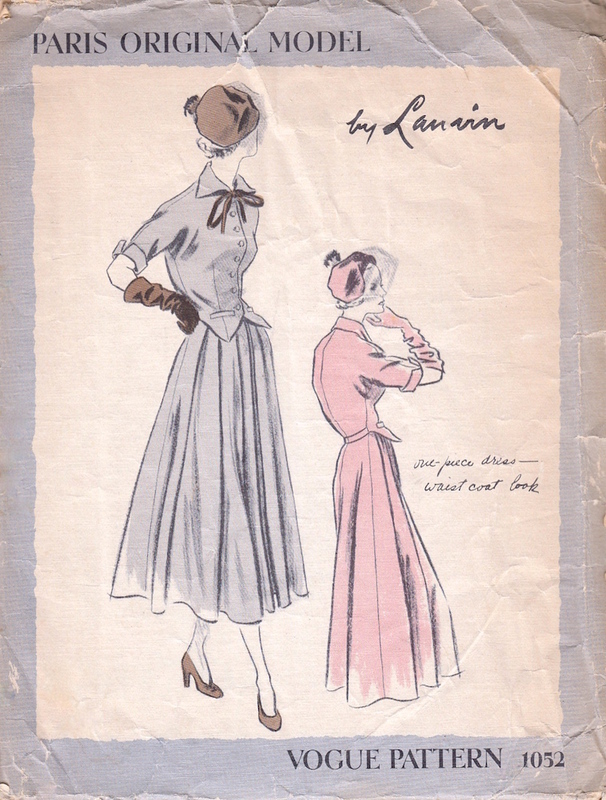 Vogue 1052 by Lanvin (1949) Image via eBay. 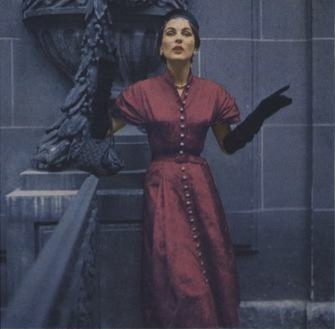 Lanvin pattern Vogue 1052 in Vogue, March 1949. Photo: Clifford Coffin. What do Bloomingdales and Crayola have in common?